WWAC’s Wendy B and Ashley Schmuecker both went to see the film on separate occasions, and here’s what they have to say about it! It’s week three, and The LEGO Movie remains in the top spot at the box office, defying the apparent odds against toy-based movies. Perhaps the trick here is simply that, by default, The LEGO movie is a film that automatically relates to children, young and old, because of the subject matter. Who doesn’t remember their very first LEGO set – or maybe even still has one lying around? The truth is, this is actually a 90 minute commercial for a toy company. Sssh… don’t tell Fox News, who believes the movie’s anti-capitalism theme is bad for society. Wendy B: A lack of daycare options means my husband and I don’t get out to the movies often and when we do, it’s usually with our daughters, aged eight and five. I can’t remember the last grown up movie we’ve seen in the theatre, but I definitely remember Cloudy with a Chance of Meatballs 2, Frozen, and most recently, The LEGO Movie. While we’d love to catch more movies in the theatre for that full blockbuster experience, there’s a lot to be said about enjoying them with our kids. Even films that might not be quite as entertaining for us, can still make us smile as long as the kids are happy. However, I do appreciate films that put greater effort into keeping the adults entertained. Wise movie makers recognize that we are paying for and have to sit through a feature length film, so it behooves them to make it as enjoyable as possible for all ages. Disney and Pixar are the reigning champions of this, but I still find myself explaining to my daughters why I am laughing at a particular moment, when they don’t get the joke. As I continued to watch the trailer, I was super stoked on appearances by Wonder Woman, Ninja Turtles, and Gandalf. So, enticed by the promise of some of our favorite actors and superheroes, my partner and I went on Valentine’s Day. 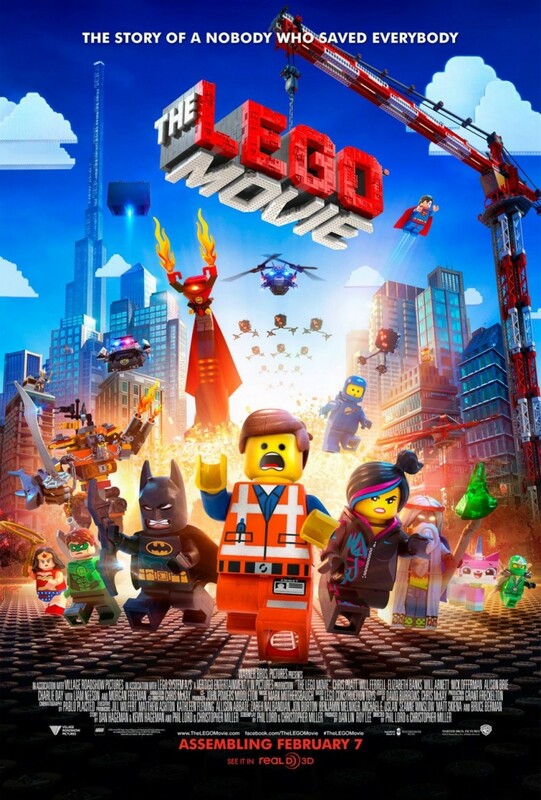 Wendy B: The LEGO Movie fulfills the ‘accessible to all ages’ criteria almost by default, simply by being about LEGO, a toy that we have grown up with and that we’ve made sure is readily available to our children. We also play the various LEGO video games and have watched a few of the videos, so seeing the movie was just the next logical step. But it really impressed me because it struck the fine balance that allowed all of us to share the laughs equally. The jokes worked on all levels, from sight gags to pratfalls to subtext. Batman in particular was hilarious for all of us. I am a big fan of writers like Greg Rucka who recognize that Batman is really kind of a jerk, and was pleasantly surprised to see Batman at his arrogant finest here. My husband and I shared a giggle over his inept Bataranging, which was reminiscent of my own inept Bataranging in Batman: Arkham City. The girls didn’t get many of the inside jokes, but they could still appreciate the visual humour and Batman’s over-the-top attitude. Ashley: It may have been that I was pretty exhausted from being sick all week, but I was a little yawny and felt that it was paced much slower than I anticipated. Chris Pratt and Will Arnett do get lots of laughs throughout. 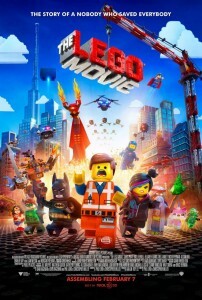 Pratt as Emmett, an ordinary construction worker, finding himself at the heart of a prophecy to stop President Business from wreaking havoc on the many LEGO lands. As we follow Emmett on his adventure, he has brief run-ins with Superman, Green Lantern, Gandalf, Abe Lincoln, and a whole host of random characters from literature and history; however, I was really craving more interaction with the other Master Builders from all the different LEGO lands. Of all those random LEGO folks, a couple of my favorite characters were Unikitty, voiced by Alison Brie from Community and Wyldstyle. The LEGO.com website best describes Unikitty: “Hailing from Cloud Cuckoo Land, the capital of rainbows and puppies, she is half unicorn, half animé kitten and one endless dance party.” Brie’s voice fit Unikitty perfectly. Wyldstyle (no, she isn’t a DJ) is a Master Builder capable of engineering great machines from ordinary LEGO pieces she finds, refashioning escape motorcycles from ordinary objects in the city. She helps guide Emmett to his destiny as The Special. As all those random, loveable LEGO characters converge to fulfill the prophecy, the perspective shifts and the storytelling is re-framed brilliantly. I already want to rewatch the film with the shift in mind and see how it influences how I perceive the characters and dialogue. 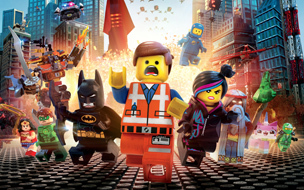 Cute, quirky, with enough adult minded humor throughout, The LEGO Movie is a definitely a must-see. Wendy B: My daughters loved all of the characters and I’m happy with the message the movie delivered. The theme is about combining the freedom of creativity with the structure of instruction as everyone works together to have fun and accomplish their goals. I love movies like Harry Potter that encourage reading, and I absolutely love The LEGO Movie for encouraging creative play. Our LEGO sets have been strewn across the living room floor every day since we saw the movie, though thankfully, no one has stepped on any pieces. Yet. And the final verdict from Wendy and Ashley? Well, everything is awesome, of course.